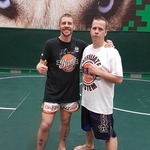 How to develop fundamental footwork for Muay Thai, Kickboxing and MMA with Duane Ludwig & Bang Muay Thai Coach Joey "The Don" Banks demonstrating "The Hands and Footwork Drill". I love that hand and footwork drill. Even the rhythmic sound is cool. 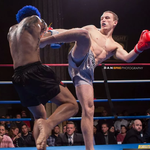 If you are doing the Hands and Footwork Drill on a heavy bag, how do you keep the bag from jamming your cross on the way back?